An Afghan man has appeared before a London court, charged with torture and kidnapping in his home country. 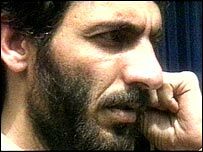 Zardad Faryadi Sarwar was charged on Wednesday night under the Criminal Justice Act 1988 with 16 offences relating to his time as a military commander during the Afghan civil war in the early 1990s. The 40-year-old from Streatham, south London, who is also known as Zardad Khan, was arrested by Scotland Yard's anti-terrorist police on Monday. He appeared at Bow St Magistrates' Court on Thursday where he was remanded into custody to appear at the Old Bailey on 25 July. Mr Sarwar is thought to have left Afghanistan when the Taleban came to power and has claimed asylum in Britain. According to the Independent newspaper, for the past three years he has run a pizza parlour in Bexleyheath, south-east London. It is understood that Mr Sarwar was arrested on 10 May this year but was released on bail until August. Mr Sarwar operated roadblocks at a town called Sarobi, on one of the major routes into the Afghan capital, Kabul, during the early 1990s. He is charged with nine counts under section 134 (1) of the Criminal Justice Act 1988 that, as a military commander in the Sarobi region of Afghanistan, he tortured or gave orders for torture to be carried out as part of his official duties. He faces five counts under section 1(1) of the Taking of Hostages Act 1982, that he detained hostages and held them to ransom, threatening them with death if money was not forthcoming. He is charged with one count under section 1(1) of the Criminal Law Act 1977 that he plotted with others to carry out or order torture. He is further charged under section 1(1) of the Criminal Law Act 1977 that he plotted with others to take a hostage.